(Hillsborough, N.C.) – Under the leadership of Sheriff Charles Blackwood, the Orange County Sheriff’s Office has recently undergone a major overhaul. Prior to Sheriff Blackwood taking the helm, the agency operated a fleet of brown Ford Crown Victoria PPV’s with out-dated rotator lightbars. 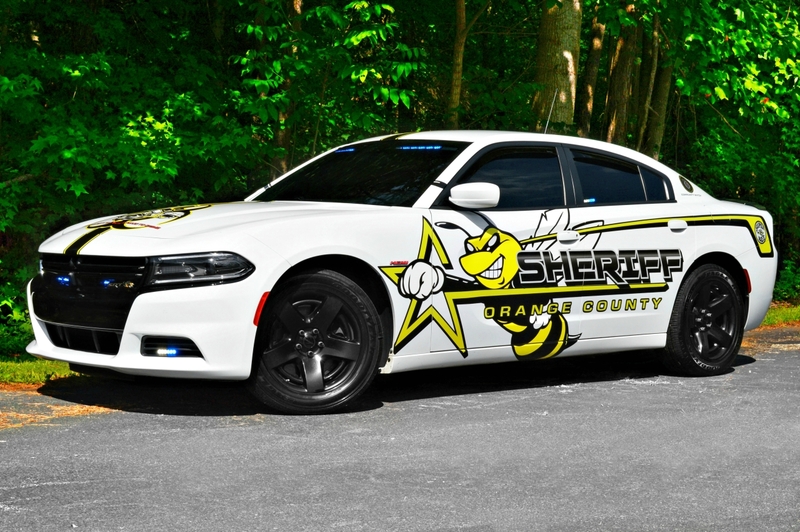 Realizing that the agency needed to update its fleet, the Sheriff transitioned the departments cruisers to slicktop Dodge Chargers while introducing a new graphics package and unveiling a community relations vehicle. The 2016 Dodge Charger affectionately nicknamed the “Super Bee,” is assigned to the agency’s Community Services Division. This vehicle features a bold graphics package that includes several unique design elements designed to grab the attention of individuals of all ages. The vehicle is primarily used at neighborhood watch meetings, parades, and other high-profile events where it can be used to help as a public relations tool. In essence, the “Super Bee” has become a powerful symbol in the community that has allowed the agency to create dialogue between the Sheriff’s Office and the residents of Orange County. We’d like to thank the Orange County Sheriff’s Office for providing us access to this vehicle, and hope to see this idea carry over to agencies in South Carolina.